Cooldek Roofing is a Stratco solution for insulation in your outdoor entertaining area. With the innovative insulated roofing panels you can control the climate and make entertaining your family and friends more comfortable. 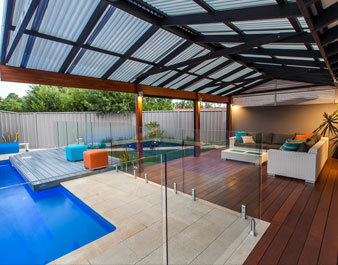 Cooldek cladding also provides a ceiling finish for an all-in-one practical outdoor solution. 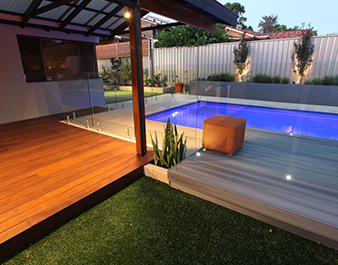 It has outstanding cooling capabilities, which are essential for any Perth patio. The Cooldek polystyrene core is surrounded by stylish, coloured steel allowing it to withstand harsh weather whilst maintaining the style of your patio. The insulation not only helps improve comfort on hot days but can also reduce noise caused by rain, so you can enjoy your outdoor area throughout all four seasons. This also lessens the need for air-conditioning and fans, reducing your carbon footprint. The Cooldek solution is available in classic and CGI finishes, both with three layers of insulation thickness. 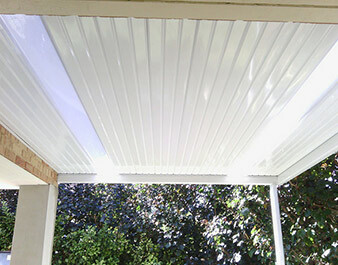 They are available in a variety of popular roof colours, allowing the patio to integrate with your existing structure. White and other high gloss coloured options are also available for the ceiling. This particular ceiling looks fantastic with the incorporation of down lights or feature lights, giving a sophisticated and polished finish to your outdoor transformation.